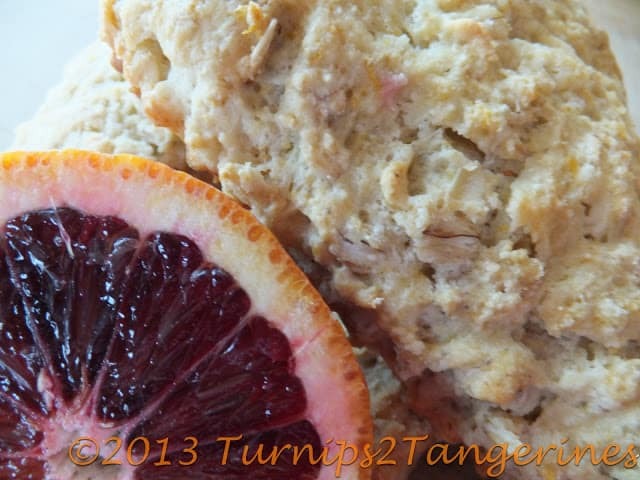 Blood Orange Scones with Orange Glaze are a true delight. They are called blood oranges due to their deep red, color. If you have never experienced a blood orange, pick one up. You’ll never forget the first time you cut a blood orange open and see how red the flesh of this orange truly is. Blood oranges have a sweet/tart flavor and are great used in a sauce used to top vegetables. Particularly cooked asparagus and green beans. Blood Oranges are grown primarily around the Mediterranean and now in California. This sweet/tart orange has a bright red or red-streaked white flesh. Most blood oranges are best eaten fresh, but the more acidic varieties, like the Maltese, work well in cooked sauces. The Hollandaise-based Maltaise Sauce, is a Hollandaise blended with orange juice and grated orange rind. The perfect accompaniment to cooked vegetables. Here at Turnips 2 Tangerines, we love our scones. After you make blood orange scones with orange glaze, make this recipe for Lime Cherry Berry Scones with Vanilla Lime Glaze . Look through our Recipe Box for more scone recipes you will want to try. 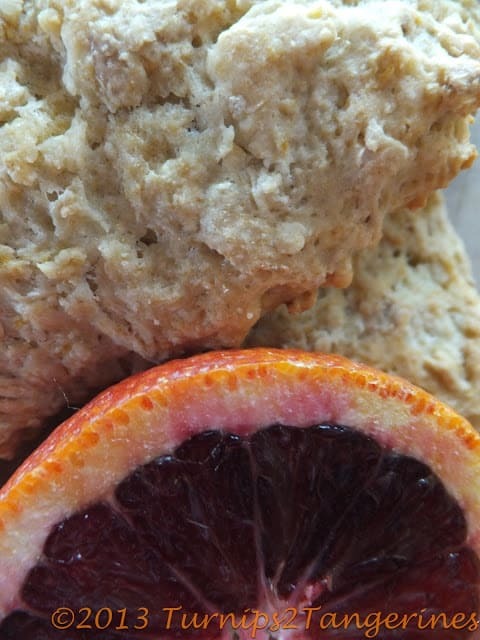 A delicious citrus scone made with the brilliant red fleshed blood orange. Preheat oven to 400º Line baking sheet with parchment paper. In large bowl, combine flour, oatmeal, sugar, baking powder, salt and baking soda. Cut in cubed butter with pastry blender until mixture resembles coarse crumbs. With fork, stir in blood orange zest. In small bowl combine egg, blood orange juice, yogurt and milk. Add milk mixture to flour mixture, stir together. Turn dough out onto well floured surface, knead 8 to 10 times. Pat dough into 8 inch circle. Cut dough into 8 wedges. Place on parchment lined baking sheet. Bake for 12 to 15 minutes or until lightly browned. Mix together confectioners sugar and juice until reach desired drizzle consistency.